Miniature goat breeds are an excellent choice for people who don’t want the hassle of handling larger animals or don’t have the amount of space and pasture they require. They also make wonderful pets because of their friendly personalities and variety of colors. Since they are usually kept in small flocks, they have been bred to be highly prolific and feed efficient, even multi-purpose breeds such as the relatively new breed, the Nigora. First developed in Oregon in the 1990s, the Nigora goat is a multi-purpose breed that produces both fiber and milk and is the only fiber breed that is also a dairy goat. First generation Nigoras are a cross between a Nigerian Dwarf and an Angora, usually a Nigerian buck and an Angora doe. These first crosses typically display cashgora type fleece, inheriting the crimpy down genetics from the Nigerian and the lustrous mohair genetics from the Angora. Their milk production rivals purebred Nigerians as they tend to be larger than pure Nigerians and they can produce a variety of fleece types perfect for hand-spinners. You won’t be starting a commercial dairy or fiber mill with Nigoras, but they are the perfect choice if your goal is to supply your family with milk and fiber. The Nigora’s fiber comes, of course, from its Angora heritage. Angora goats produce long ringlets of lustrous fiber called mohair, which has no crimp and grows mainly from the secondary follicles. Unlike cashmere, these fibers are not wool-like and their growth surpasses the production of the primary follicle hair that would be the guard hairs protecting a woolly undercoat in cashmere goats. High quality Angoras may also produce mohair from the primary follicles, though these follicles often grow kemp or medulated fibers which are coarse fibers, undesirable in the fleece. Kid mohair can be as fine as 20 microns, with adult mohair in the 25 – 45 micron range. Fiber length, diameter and yield are all highly heritable, even so it can take several generations to develop Nigora fleece to the quality of fine mohair. Dairy genetics will, naturally, come mostly from the Nigora’s Nigerian Dwarf heritage. Nigerian Dwarfs produce an average of 2 quarts of milk per day, some even up to a gallon per day, and are more feed to milk efficient than standard dairy goats. Their milk also has the highest butterfat, up to 10%, of any other dairy goat breed. Milk yield and butterfat content are both moderately heritable (feed and other environmental factors play a larger role, but genetics dictates the highest potential), so selecting Nigerian bucks of superior milk lines is an effective way to ensure your Nigoras are good milk producers. Swiss type Mini-Dairy breeds (Alpine/Toggenburg/Saanen/Sable/Guernsey X Nigerian Dwarf) of sixth generation or higher can also be used instead of pure Nigerian Dwarfs, preferably those that are at least 50% Nigerian Dwarf. Nigoras can be either horned or disbudded as Nigerians are generally disbudded and Angoras are always left horned. Deciding whether or not to disbud may depend on whether you’re primarily after milk or fiber. In a dairy operation, horns can be a nuisance and get caught in milk stands and stanchions, but in fiber herd where goats are normally kept in open housing they can be useful as handles when it comes time for shearing. Also, Nigerian’s horns, like other dairy breed horns, grow outwards away from the head whereas Angora horns are swept back before spiraling out, making them safer and less likely to get caught. We decided to leave our Nigoras horned so that we can select for this Angora type horn. Whichever you decide, it’s best if horned and non-horned goats are not kept in the same herd as horned goats can easily injure non-horned goats who don’t have the means to defend themselves. You might also consider polled (naturally hornless) goats, a trait found in both Nigerians and Angoras, although it sometimes comes along with fertility problems. With the variety of genetics from these breeds, the Nigora breeder has a lot to choose from. Either white or colored Angoras can be used in Nigora breeding. White in Angoras is a dominant color, so all first generation crosses from white Angoras will be white, masking any other colors they carry. White Angoras can also carry color genetics just like colored Angoras, but it is masked by the dominant white allele. Colors may reemerge in the second generation when the dominant white allele can be knocked out. Colored Angoras come in a variety of colors and patterns. They range from solid blacks, grays, reds and browns to several striped patterns and pinto. There are also indications of a dominant black allele in colored Angoras that masks striped patterns. Black goats that throw striped kids must be carrying this dominant black, which is still recessive to white. Nigerian Dwarfs are available in all colors and patterns found in goats, including pinto, roan and the more rare moonspots. Though Nigoras are accepted in all colors found in both the Nigerian Dwarf and Angora breeds, you might want to ask yourself how much color you want in any one individual fleece. Type A: Mohair grows from the same secondary follicles that produces the down in cashmere goats but the fibers are thicker and have no crimp. Its growth surpasses the abundance of the primary follicle hair, which may also exhibit mohair qualities. These primary follicles can also be the source of kemp and medulated fibers which are coarse, hollow fibers. These are the true hairs which cannot be spun into yarn, making them undesirable in the fleece. The presence of such fibers is most obvious along the spine of the goat where they may stick out. In a high quality fleece, there is no distinct difference in fibers from the primary and secondary follicles so it is considered a single coat. Because goats with this type fleece have neither insulating down nor a protective, water-shedding outer coat, they must always have adequate shelter from cold and wet weather. Mohair does not molt and must be shorn twice each year. Type B: This is a typical cashgora type fleece which displays the characteristics of both types A and C fleeces. It is between 3 and 6 inches long and curly with an obvious guard hair, though it may be finer than that found in cashmere goats. A third hair type may also be present, silkier than the guard hair, but far from the quality of true mohair. The fleece overall should show luster and be soft to the touch. Color is usually a shade lighter than the true hairs, as also seen in cashmere. Type C: Cashmere is the soft down which grows from the secondary follicles during the winter and sheds in the spring. It is highly crimpy, tends to be lighter in color than the main coat, and can be anywhere from 1 to 3 inches long. Cashmere requires the primary follicle guard hairs to protect the down from UV light damage and contamination from VM (vegetable matter). It can be either combed out in the spring or shorn just before the molt. Combing is most common, as shearing requires the fleece to be dehaired either by hand or with a commercial dehairer. It can take up to two weeks for the entire fleece to molt and must be combed each day during this time to harvest all of it at its peak quality. There are also fleece types A/B and B/C which exhibit characteristics in between the three distinct types. 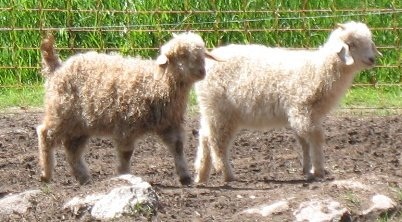 The only types of hair that are always undesirable in purebred Nigoras are an overabundance of kemp and medulated fibers, and “slicks,” which are flat coated goats exhibiting no fleece type, though these can still be used as breeding animals crossed back with Angoras or Nigoras of mostly Angora breeding. Detailed information and pictures of the various fleece types is limited as fleece type does not yet breed true and the Nigora breed itself is still being developed. When multiple products are asked of any one animal, nutrition becomes a paramount concern. Both fiber and milk require several minerals and when these are not found in adequate amounts in the diet, they can be taken from the body of the animal and production and quality will plummet. A deficiency for even a short time may result in weak spots in the fibers of the fleece which may break during processing. Constant adequate nutrition is especially vital in kids to insure proper bone development and optimum follicle development for increased fiber production throughout the goat’s life. Depending on the availability of minerals in your area, you may want to consider extra mineral supplements such as monthly drenches and annual boluses to produce the highest quality fiber and milk production from your Nigoras. Extra energy as well is required to maintain health and continue to produce fiber and milk, but too much energy can cause fiber diameter to increase and negatively impact fleece quality. The key is the right balance: enough energy to grow optimal fiber but not too much that will cause fibers to grow too thick. Even with added nutritional support, each goat will likely excel at either fiber or milk. When starting with Nigoras, you can look for lined Nigoras or start your own line from scratch with Nigerian Dwarfs and Angoras. If you decide to start from scratch, evaluate the milk and fiber potential of prospective goats of both breeds as Angora dairy genetics and Nigerian fiber genetics will also contribute to first generation Nigoras. If you can, look for Nigerians that have a good amount of down under their coats in the winter and early spring. These will have good fiber genetics and produce thicker fleeced Nigoras. Check the udders/teats of both does and bucks of any breed to ensure they are well shaped and placed (no doubled, blind or malformed teats) as this defect is heritable and highly undesirable in dairy goats. Starting with the highest quality Nigerians and Angoras you can afford will be the best way to ensure results in your Nigora program, but Grade animals also make great, affordable breeding stock and their contribution to a Nigora breeding program shouldn’t be underestimated. If you are unable to obtain purebred Nigerians or Angoras, there are several alternative breeds that are accepted in producing Grade Nigoras. Pygoras, Cashgoras or other mixed fiber breeds preferably of more than 75% Angora parentage are all acceptable as well as Nigerian/Pygmys crossed back to purebred Angoras. Even goats of unknown ancestry which fit the Nigora standard may be used and considered Grade Nigoras. No matter which breeds you have to pick from, select animals that appear thrifty, vigorous and without any undesirable or disqualifying flaws. Nigerian Dwarfs and Angoras have different breeding cycles which need to be taken into consideration when producing first generation Nigoras. Angoras cycle once per year in the fall, though they can be induced to cycle at other times of the year by introducing bucks after they have been kept entirely isolated. Angoras also tend to have singles and twins. Nigerians cycle year-round and are highly prolific, often having triplets and even occasional quads and quints! However, multiple birthing has a rather low level of heritability, so selecting goats from triplets or quads will prove ineffective in increasing the occurrence of multiple births in Nigoras. Environmental factors during and just before the breeding cycle have much more to do with the number of kids born. When breeding Nigoras, there are several terms you will need to be familiar with when classifying kids. F-Generation: Refers to how many generations a goat is from the original Angora/Nigerian or Mini-Dairy stock. F1 being a first generation cross, F2 a cross between F1s, etc. A cross between mixed generation stock produces offspring a generation one step further along than the lower generation parent. For example, a cross between an F2 and an F6 will be an F3. Must be an equal ratio of fiber/dairy breeds. Standard Nigoras: Nigoras of equal Angora and Nigerian/Mini-Dairy heritage which fit the Nigora Standard. Heavy Nigoras: Nigoras of more Angora heritage than Nigerian, preferably still less than 75%. Tend to be larger and have more Angora characteristics with A or A/B type fleece. Light Nigoras: Nigoras of more Nigerian or Mini-Dairy heritage than Angora, preferably still less than 75%. Tend to be smaller with B/C or C type fleece and higher dairy propensity. Grade Nigoras: Nigoras of unknown or mixed fiber breed (Pygora, Cashgora) heritage which fit the Nigora Standard. NOA (Native or Nigora on Appearance) is another term for goats of unknown parentage which fit the Nigora Standard and can be considered Grade Nigoras. As of 2018, the ANGBA is accepting Nigora’s for registration. Three categories sort Nigoras into different levels according to quality: Blue List, Red List and Breeding Stock. Red List: Standard Nigoras from unregistered yet purebred foundation stock. Breeding Stock: Heavy and Light Nigoras that come from purebred foundation stock. These might not fit the Nigora standard exactly but they are valuable breeding animals and their offspring may be categorized as Blue List or Red List depending on their Angora/Nigerian or Mini-Dairy ratio and the registration status of their parents. Purebred, registered, Miniature Swiss Dairy goats of sixth generation or greater, preferably at least 50% Nigerian heritage, may be used in place of purebred Nigerians to produce Blue and Red List Nigoras. However, alternate fiber breeds such as Pygora, PCA, Cashgora and Mini Cashgoras, preferably greater than 75% Angora breeding, can only be used to produce Grade Nigoras. The ideal Nigora should be 19″ to 29″ tall with good dairy form and light build. Ears can be erect like Nigerians’ or drooping like Angoras’ or in between (airplane ears), but mismatched ears are not desirable and pendulous ears like Nubians’ is a disqualification. Head shape should be like Nigerians’ and Swiss type dairy goats’ with a straight to dished face, no convexed or roman nosed faces like Nubians. Evidence of Myotonia (fainting) is a disqualification. Eyes can be any color found in the foundation breeds including brown, gold, blue and mixed colored eyes. Blue eyes are found most commonly in Nigerians though it is also seen in some white Angoras. It is a dominant trait so it’s easy to breed into Nigoras, adding that extra bit of color without adding color to the fleece. For a detailed description of the ideal Nigora and a list of undesirable/disqualifying traits, see the Nigora Standard of Perfection on the ANGBA website. The best way to see results in your Nigora breeding program is to set your priorities for milk and fiber to suit your needs and devise a breeding plan to achieve them. In keeping your does in milk you will naturally have a steady supply of fine kid fleece. Even wethers can be a valuable part of your fiber flock as they produce more fiber than does, with less diameter than fiber from bucks. They are also more docile than bucks and have no odor. Don’t be so quick to cull wethers from your herd as they can also prove the quality of the fiber genetics of their parents. Of course, they produce no milk, but if you’re more interested in the fiber and small size of the Nigora, wethers may be just the right choice! You will have fun developing the breed to be the perfect fit for your family’s needs and seeing the results of your work will be highly rewarding! For more pictures and information check out the American Nigora Goat Breeders Association website (Established in 2006) and the American Nigora Goat Enthusiasts Facebook Group. Disclaimer: the above are affiliate links and I will receive a cut if you make a purchase through them. If this bothers you for any reason, feel free to go directly to the website and search for the item by name. However, if you’ve found this article and list helpful, I would greatly appreciate your support! Subscribe to Wee Acres Blog! Wee Acres blog turned 4 today! May’s Picture of the Month: “Turkeys Climbing Trees” This is our young flock of turkeys climbing the trees out in the goat pasture. On April 4th, Sanibel gave birth to her single chamoisee pinto buckling. He is huge, we had thought for sure Sanibel was going to have at least twins. He is the biggest kid we have had born here yet and he has nice width and good length. He has brown eyes with a blue ring in each. These pictures were taken when he was just an hour old. Misty had her very first kid at 7:30 pm on March 28th! She is a beautiful little doeling and she is also the first kid out of Leopold born here on our farm. She is a buckskin pinto with blue eyes but we can’t tell yet if she has any moonspots.